At Academic School Blazers we believe you our customer are the most important part of our business. As you'll read from our testimonials this is not just lip service either, No Way! Academic School Blazers is committed to making your experience in dealing with us the easiest and most customer focused service you've evr experienced from a school blazer manufacturer. Your 100% Quality Money Back Guarantee. You maybe thinking we're made for offering such an amazing guarantee! The simple fact is though in the last few years we've made well over 4500 School Blazers and we've only ever had 2 returned (And hey, they were just in need of some quick repairs due to some playfield antics!). So you see it's this proven track record in quality and service that let's us offer you this 100% Quality Money Back Guarantee. When means when you invest in the Academic School Blazers range you have our guarantee that if for any reason you're not happy with the quality then you can return it and get your money back guaranteed. No questions asked! Nothing but QUALITY for you. You see, the simple reason why we've only ever had two school blazers returned in the last 8 years is we believe in quality. That's why all your school blazers are made by a manufacturer totally committed to quality... no shortcuts anywhere. Good Old Fashioned Customer Service... now honestly where has this gone these days? Well I can guarantee you right now it's still alive and well at Academic School Blazers because we pride ourselves and push ourselves to give you, our customer, the best possible customer service we can give. In fact nothing delights us more than being able to help you get exactly what you want and need in your School Blazers. Life is too short to put up with bad customer service, so call Brent now on 03 365 5744 because you deserve better, don't you? Your best price, first time! At Academic School Blazers we understand your time is important to you so when you ask us to give you a quote, then we give you our best price, first time, every time. We don't believe in wasting your time going back and forward haggling over price. We prefer to deal with the price once and let our quality and service speak for themselves! And remember you have our 100% Quality Money Back Guarantee on that! Oh yeah, I should mention, just because we provide this amazing guarantee, it doesn't mean we're over the top when it comes to pricing because remember we are the manufacturers! That's right, there's no greedy middle man or retailer taking their cut when you deal direct with Academic School Blazers! Just another way we can provide to you, great value for money! Doesn't it give you peace of mind that the School Blazers your children will be wearing haven't been made in some dodgy back street sweat shop somewhere in the world? Each Academic School Blazer is made by a manufacturer totally committed to quality, absolutely no shortcuts anywhere. And hey, you're more than welcome to come in and see our operation, it would be an honor to show you around our place! 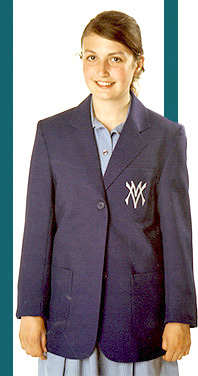 Over 50 years experience goes into each Academic School Blazer. That's right over 50 years experience in each School Blazer. As the owner of Academic School Blazers I'm very proud of the fact that I have some of the most experienced School Blazer makers in New Zealand. It's because of their experience and skill that I'm able to bring to you a quality product that is second to none! This really is your peace of mind that we make quality goods for you and your children. Please take the time now to pick up the phone and call me on 03 365 5744 because I want to help you and make it easy for you to get the right School Blazers for your School. Don't delay do it now while it's still fresh in your mind. Call me right now on 03 365 5744 just ask for Brent. Or if you prefer just email me on uniforms@stylerite.co.nz.